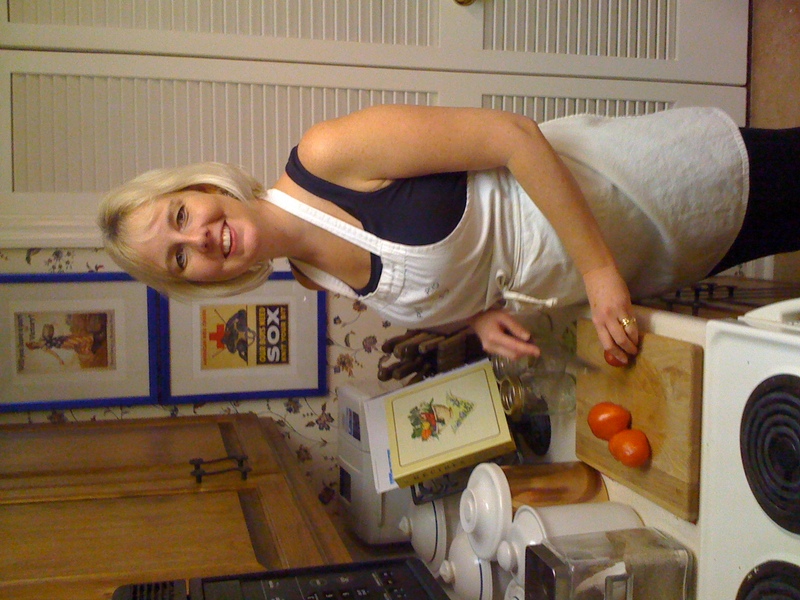 Jennifer is in my kitchen today, talking about her long-standing love of pasta, her old-fashioned favorite kitchen tool, and her thoughts on food safety. Jennifer Patterson Lorenzetti had her first garden—and her first compost pile—at the age of 8. Armed with vintage canning recipes from her grandmother and great-aunt, she began her journey toward sustainable homemaking, adding skills in textile arts, food preparation, and savvy shopping and budgeting. In 1997, she founded Hilltop Communications, a writing and speaking firm dedicated to making complex topics accessible for a variety of audiences and through a variety of publications and venues. She has written hundreds of articles for a range of clients, and her work has received a TABBIE Honorable Mention for Best Technical Article. 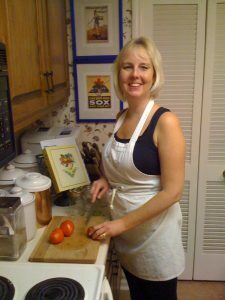 In 2009, she married the two passions and started “Fast, Cheap, and Good,” the blog that draws on her experiences as a writer and homemaker dedicated to pursuing a better life with fewer resources. For me, organic living is about respecting the systems we live with and in. I try to provide fresh, local, organically grown and raised foods for my family because I’m not just trying to stave off hunger, I want to create healthy bodies—that is, healthy systems. Likewise, I grow organic food because I know the pesticides and herbicides I could put on my garden damage the natural systems in place that make for the most nutritious vegetables and the healthiest ecosystem. Organic living is about addressing the big picture by paying attention to local-level decisions. Macaroni and cheese. In fact, one of my earliest memories as a very young child is crying because I heard that there was a recall of a favorite name-brand boxed macaroni and cheese, and, not understanding what a product recall was, I thought that they had eliminated macaroni and cheese from the planet for good. It depends on the season. In the summer, I absolutely live on plates of sliced tomatoes and cucumbers, still warm from the garden. Otherwise, I still love my pasta, although I now make my mac and cheese from scratch. I also make a lot of dishes involving pasta with fresh or home-canned veggies, dried tomatoes, or pesto from our garden. From a practical standpoint, it is probably my water-bath canner. 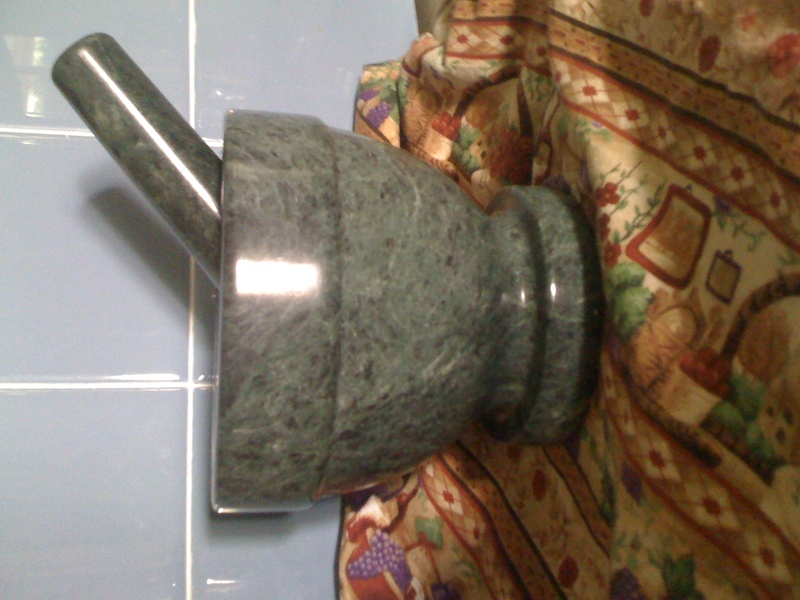 But from an emotional standpoint, I am in love with my marble mortar and pestle. I love the fact that I can use it to grind herbs and spices that I grow and dry, and I love the fact that this kind of tool, or something very much like it, has been used by men and women for centuries. It is proven, it works, and it is a link with humanity past, present, and future. I am currently rereading Barbara Kingsolver’s Animal, Vegetable, Miracle, which I do about once a season because she so wonderfully captures the joy of the process of gardening and living seasonally. I am also obsessed with knitting with Lion Brand Nature’s Choice Organic Cotton yarn because it just feels so nice in my hands. I like things that help me enjoy processes as well as end results. 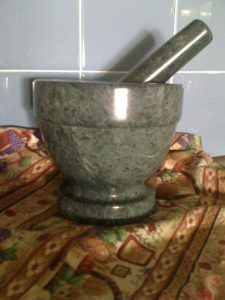 As I indicated with the mortar and pestle, I love traditional, time-tested solutions to problems. Why would you want to grind your herbs and spices with an electric grinder when you can get in there and use your own effort to get your result? I think the increase in the number of food recalls due to pathogens, like the recent problem with eggs carrying salmonella, are some of the most disturbing stories. These problems have hit all parts of our food supply, and I am dismayed whenever I see that people have to avoid eggs or spinach or tomatoes because of possible contamination. I’m particularly disturbed that standard operating procedure for handling chicken these days is to have special cutting boards dedicated to the process, to immediately stop using any towel you may have used while you handled the raw chicken, and to clean the prep area with a disinfectant afterward, all as part of a process that depends on cooking the chicken sufficiently to kill anything it may have carried in from the CAFO. I hope people can take a step back and see that when we have to treat our food as a disease vector instead of a source of nutrients and pleasure, we have evidence of a system that has been strained to the breaking point. I am online all day for my job as a writer, so I primarily get my breaking news from news sites and from social media outlets; you really can learn a lot about what people are thinking from Facebook, although you have to be continually mindful that Facebook is not a scientific sample of opinions—you see what you have chosen to see. I also try to “sample” other news outlets, so I listen to some news radio when driving; I will check into television news broadcasts occasionally, if I am in my office at news time; and I subscribe to a wide range of magazines. Overall, I think the proliferation of channels of information delivery really demands a much more active consumer than ever before. We can’t just sit back at 6:00 and watch the talking heads deliver what’s important; we need to get out there in the information stream, see what others are saying, then do the research we need to come to our own conclusions. Far from seeing this as an era of passive consumption, it really can be the era of the thinking person, if we choose to take advantage. That is really interesting and it puts the basics right there for you to choose what and how you want to do things. Many more of us should pay heed to not only what we eat but what we use for information. I am in love with Jennifer Lorenzetti’s words and I love how she has created a thinking world that revolves around our daily home lives!